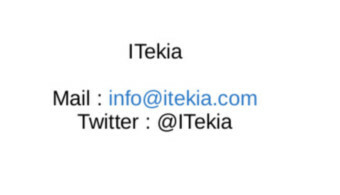 ITekia deserves to provide a professional and excellent client service, to provide the client with a great experience and to advance the knowledge and breadth of the Information Security sector. If you are seeking technical and human challenges, you can join an enthusiasm team where you can work on several Information Security topices: Advisory, Assurance, Penetration Testing. You will work within an open and collaborative environment where you can innovate and make discoveries through key research work. Master or PhD diplama holders and with a first Information Security experience (Penetration Testing, Reverse Engeenering, Federated Identity, ...), you want to add value to our clients. You want to invest your time and bring expertise whilst building solid, productive relationships with colleagues and clients.